There are a few different models available of Keurig coffee machine for commercial use. We have discussed 3 of the latest models from Keurig below. So, how would you like to be the coffee hero in your office every morning? With the Keurig Coffee Maker designed Especially for the office environment, you can realize that dream. Well, that’s what Keurig says on its website for commercial Keurig coffee machines. Featuring a system that will cater to each person’s coffee tastes, the Keurig Coffee Machine will answer the dilemma of who gets to make the coffee at work. So how are these coffee machines categorised? They are basically categorised on 3 different aspects – the number of employees, weather the coffee maker will have access to a water supply, so you do not need to manually refill after every 8 cups and whether you would like a Vending Keurig coffee. 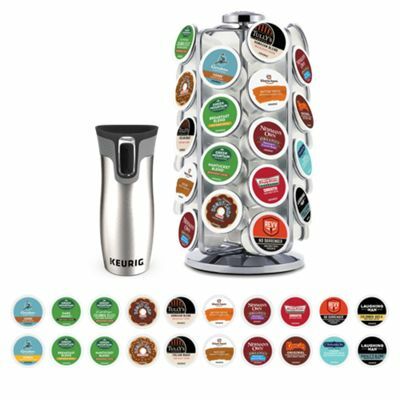 All the Keurig commercial coffee models come with a removable drip tray, which can be a useful feature as it can allow travel mugs to be filled in easily. And all these machines give you a choice from around 190 different flavours of K-cups to choose from. So there definitely will be a flavor to satisfy every taste bud in the office. Designed for offices with 15 employees or less, the Keurig B140 Brewing System is the smallest of the Keurig commercial coffee machines. It features three brewing sizes. Each person can program for a 6 oz., 8 oz., or 10 oz. cup of coffee. Of course, the variety of K-Cups offered should satisfy every one in your office with their particular selection of coffee. This compact pour-over model of the Keurig Machine comes with a removable water reservoir. The Keurig B140 also comes with a removable drip tray that allows for the tall, travel mugs to fit under the stream of pressurized hot water that brews your special cup of coffee. The B200 Keurig Brew System can be used as a pour over system or it allows for the water to be plumbed into the machine. The drip tray is removable allowing for the use of travel mugs. It dispenses an 8 oz. or 6 oz. cup of coffee. Because this system is designed for the office with 15 – 30 employees, this Keurig Machine allows for back-to-back brewing, one cup in every minute. If you are looking for a coffee machine with a vending option, the Keurig B200 Coffee Brewing System is for your office. The vending kit allows for multi-coin use. The LCD screen provides instructions of each user; for the multi-lingual office, the instructions are available in English, French, and Spanish. There is also an LED water tank level indicator. The Keurig B200 Coffee Machine plumbed version allows for the use of filtered water in the machine as well. The B3000 Keurig coffee machine is designed for large offices with plenty of advanced features. It needs access to a water supply and only allows water to be plumbed into the machine. This system comes with all the features of a B200 Keurig brewing system, and some advanced features like unlimited back-to-back brewing in less than a minute. 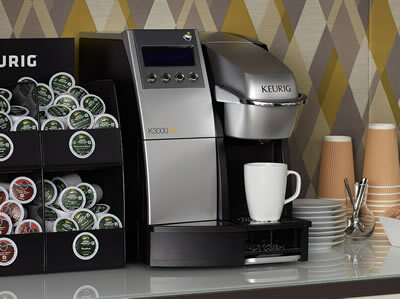 Another useful feature to have for large offices is the automatic storage and ejection of the used K-cups for a minimal mess. All of these machines are available for a free 3-day trial in your office. Keurig Commercial Coffee Machines are not available through their website. The only way is by signing up on the website to have someone contact you about the trial and to give you the sales information you might need. Because everyone in your office probably prefers a different brand and type of coffee, not to mention how strong it should or shouldn’t be, the K-Cups for these machines offer a versatile way to overcome those differences. One person needs decaf and the other person wants strong, bold flavoring? Not a problem. One person prefers flavored coffees while another prefers regular? Again, not a problem. With over 190 varieties that include not only coffee but hot chocolate and tea, there are plenty of options for each person to choose from. You might want to purchase the variety pack to begin with so that each person can try several different kinds of coffee. Just as Keurig came to the rescue in your home, let them come to the rescue in your office with their Commercial Keurig Coffee Machine. Fill out the online form and you’ll hear from a sales person very quickly. Your free 3-day trial period will have everyone in your office wondering why you haven’t tried this option before.